In 1899 when they started the Blue Pencil Club, the men were a bunch of rambunctious, though well-established, writers. They rented some rooms on Spruce Street in lower Manhattan. Around the corner, the row of buildings that housed the city’s newspapers reached to the sky with a gold dome and towers. The club was a mess, though. One flight up. . .
That was just one of several problems – the bar in the club. From time to time, police busted the members for lack of a liquor license. But who had the heart to penalize such rollicking consumers of theater, literature, and Chinese culture? Purveyors of wit that has, 117 years later, lost some of its luster, they joyously took down Tammany Hall, pompous publishers, and business titans. But it should be noted they were rather smug themselves. The point of the club was to have a good time, and to publish the Blue Pencil Magazine which they packed with doggerel, drawings, and tales ridiculous and fantastic. And the names of these men? They were Billy Burgundy and Mickey Finn (pseudonyms) and Billy Fales. 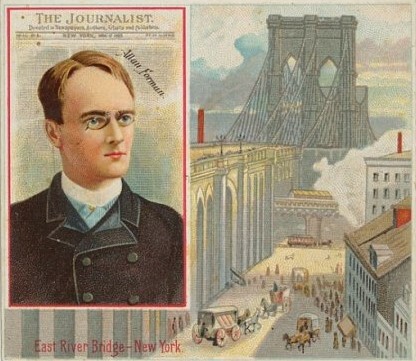 And there was Forman, the pince nez’d scion of one of Brooklyn’s first families who got his start when the legendary Irish editor of the Brooklyn Daily Eagle, Thomas Kinsella, sent the lad to San Francisco in 1877 to cover an anti-immigrant uprising fomented by a labor leader named Denis Kearney. Forman ended up reporting on the Sand Lot riot, a three-night rampage during which four Chinese men were killed. He went on to write about theater, manners and the like. For 25 years, he edited The Journalist, the nation’s first magazine for writers and editors. His essay, “How to Eat an Orange,” which appeared in Northwest Magazine in 1890, was well-received as they used to say. Why would anyone named Oliver Victor Limerick need a pen name? A Mississippi native who trained to be an allopath, Limerick was an incorrigible joker. He came to New York to edit a medical journal. After a while, he decided that he would rather write stories than practice medicine. Limerick’s amusing advice column, “Billy Burgundy’s Balm for Burdened Bosoms,” and his books, such as Billy Burgundy’s Tales in Toothsome Slang, satirized romance. Percival was the confidential valve in the Borated Talcum Powder Trust, and drew down a voluptuous salary for his services in behalf of the Chafe-Allaying Industry. . . It was Percival’s wont to stake Maxine to bon-bons and blossoms from the most expensive joints every day. . . Maxine fanned the blissful bloke along in good style, and looked dead anxious for the Orange Blossom period of her career to show up. the February 1901 issue of Blue Pencil Magazine. Then there was Mickey Finn, a.k.a. Ernest Jarrold, an Englishman who had been hanging around Newspaper Row for years, contributing short stories to The New York Evening Sun, Harper’s Weekly and other magazines. He often poked at Irish immigrants. He often said that life was a joke and he generally appeared to make this epigram the maxim of his career. A poet, essayist, diplomat, attorney, and adventurer, Fales bore the nickname “the Encyclopedia.” Married thrice, indifferent father of two sons, he caroused Manhattan, eating and drinking heavily. Chow Chop Suey at Mong Sing Wah in Chinatown, the spaghetti at Maria Da Prato’s on MacDougal Street, the oyster stalls at Fulton Market, and the Lomo de Puerco con Platanos at Braguglia & Carreno on Broadway; Billy loved it all. He steered the members of the Blue Pencil Club through the night, returning at dawn to his home on Pineapple Street in Brooklyn Heights. *See posts on William E. S. Fales, 2/1/17 + 1/25/17 & about his mother, Imogene C. Fales, 5/25/16; also post on Allan Forman, March 22, 2017. It so hard to get a handle on how it was the consumer of these magazines read them. The wit seems so heavy-handed. Almost like bad television that was to come 50 years later. "Why would anyone named Oliver Victor Limerick need a pen name?" Now, that's a great line.